Orange, spinach, mint, almond, flax seeds smoothie recipe - A very nutritious smoothie prepared with healthy ingredients like spinach, mint leaves, orange, almonds and flax seeds. It is an exotic and nutritious drink which can be consumed instead of coffee and tea in the morning and evening. It is very easy and quick to prepare. You can make it fresh as and when required. This smoothie has a low-glycemic index and one can drink it without any guilt. Spinach is a rich source of calcium, Vitamin A, C, iron and fiber. The consumption of spinach in any form helps in maintaining the body health. Oranges contain ample amount of Vitamin C.
It is also a good source of calcium and potassium besides being a taste booster. 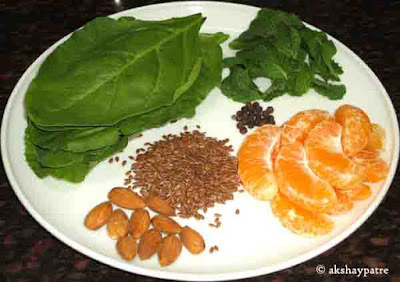 Spinach in combination with orange makes a delicious smoothie. Almonds and flax seeds adds creamy texture to the smoothie along with all its nutrient benefits. 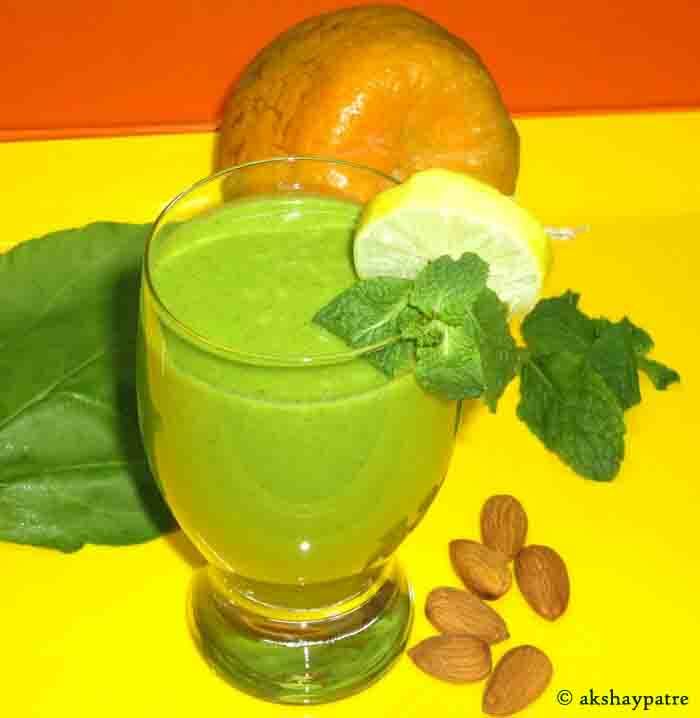 Check out green smoothie recipe which I had posted few days back. Try out these wonderful smoothie and enjoy your day. Rinse the spinach and mint leaves thoroughly. Pat to dry and set aside. Peel the orange and remove the seeds. Put spinach, mint, black pepper, roasted flax seeds, almond and 1½ cup of water in a mixer jar. Blend it to a smooth puree. Squeeze lime in it. Add rock salt and mix well with a spoon. Pour the smoothie in glasses and serve. 1. Rinse the spinach and mint leaves thoroughly. Pat to dry and set aside. Peel the orange and remove the seeds. 2. Put spinach, mint, black pepper, roasted flax seeds, almond and 1½ cup of water in a mixer jar. Blend it to a smooth puree. Squeeze lime in it. Add rock salt and mix well with a spoon.